... what folks have been through. I read about him the other day in an article called "Comedian Stephen Colbert on Gift of Suffering". 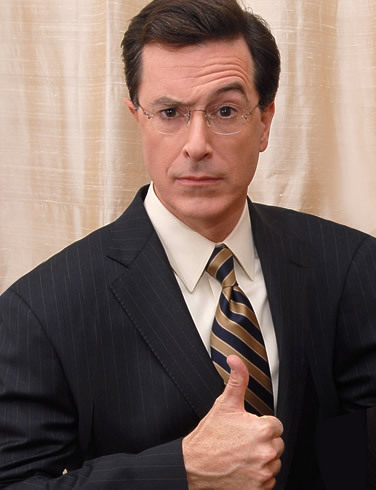 In 1974, when Colbert was 10, his father, a doctor, and his brothers Peter and Paul, the two closest to him in age, died in a plane crash while flying to a prep school in New England. "There's a common explanation that profound sadness leads to someone's becoming a comedian, but I'm not sure that's a proven equation in my case," he told me. "I'm not bitter about what happened to me as a child, and my mother was instrumental in keeping me from being so." He added, in a tone so humble and sincere that his character would never have used it: "She taught me to be grateful for my life regardless of what that entailed, and that's directly related to the image of Christ on the cross and the example of sacrifice that he gave us. What she taught me is that the deliverance God offers you from pain is not no pain— it's that the pain is actually a gift. What's the option? God doesn't really give you another choice." Whoa. You sure never know what someone has gone through. Oh, that anonymous was me- Nancy - testing out my comments..... and telling myself it was a good post. !!! it is a good post! i never knew that about him either! he does make me laugh.